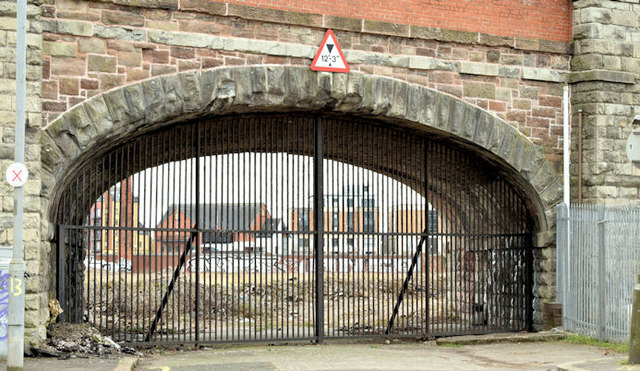 See J3474 : Railway arch, Belfast (2) (May 2011). The arch seen from Dalton Street. The former Sirocco site, still undeveloped, is behind the fence. Sirocco Quays is a redevelopment of the old Davison’s Sirocco Engineering Works bounded by Short Strand, Bridge End and the Lagan. The site extends to 16 acres and the entire project is expected to take some 10 years to complete. It is intended to include 2,000 apartments, a hotel, supermarket and other shops, offices, leisure facilities, a care home for the elderly, doctor’s surgery and open space. Note added 28 September 2011. There has not been any progress on the scheme. An administrator was appointed to the development company. Amendment 27 May 2018. With the site, sold the new owner’s proposals for the future development of the site are starting to emerge. Re-named from Sirocco Quays to “Belfast Waterside”. The developer’s website comments “Earlier this year, Swinford (Sirocco) Ltd unveiled new plans for the £400 million regeneration of the riverfront site. Following extensive consultation with communities and other city stakeholders, a new masterplan application is being proposed: Emphasising the opportunity of the riverfront with new piers, pontoons and moorings for leisure activities. Introducing new uses for community and cultural space, alongside plans for a hotel, cafes, bars, retail and restaurants. Reducing overall heights across the site, with lower buildings by the riverfront and chimney. Connecting the East Bank into the City Centre Proposals for the 16-acre site will include a landmark pedestrian and cycle footbridge creating a new connection from the city core to the east of the city. The bridge and masterplan will emphasise the re-integration of the East Bank with the rest of the city. In so doing it will help to link the whole East Belfast community with the city centre”. There is now the following application (16 February 2018) for planning permission “LA04/2018/0448/F Erection of 13 storey Grade A office building with ground floor and mezzanine café/bar/restaurant uses (sui generis), lobby/reception area, basement and deck car parking, servicing (refuse/recycling/cycle storage/changing facilities), landscaping/public realm works, introduction of temporary pedestrian/cycle access to riverfront, associated access arrangements to Short Strand and Bridge End and other associated infrastructural works Lands at former Sirocco Works Short Strand and adjacent to Bridge End and the River Lagan Belfast”. “14 Aug 2018 Two major new Belfast office developments worth a combined £70 million received the green light from Belfast City Council’s Planning Committee this evening. A 13 storey office accommodation building, including a retail unit on the ground floor alongside café and restaurant units, will be the first step in creating modern workspace for 11.5 per cent of the 46,000 new jobs that Belfast City Council is seeking to create by 2035 as part of the Belfast Agenda. The plan also includes landscaping and public realm works, a pocket park and pedestrian and cycle access” - Belfast City Council statement. This approval does not appear (16 March 2019) on the NI Planning Portal. My photographs appear as a matter of neutral record only. I have no connection with the site, developer or any group opposed to the development and have no opinion about its future. I cannot enter into correspondence. The Belfast & County Down Railway (BCDR) opened its railway line from Belfast (Queen’s Quay) to Holywood on 2 August 1845. This line was extended to the seaside resort of Bangor by the Belfast Holywood & Bangor Railway (BHBR), which opened on 18 May 1865. The BCDR absorbed the BHBR in 1884. While double-track throughout, the BCDR always regarded its Bangor line as a branch off the main line to Newcastle. However, creation of the nationalised Ulster Transport Authority (UTA) in 1948 changed matters somewhat as only the Belfast – Bangor line survived the mass closures implemented by the UTA in 1950. The old BCDR Bangor line received a further blow in 1965 when it was isolated from the rest of the Irish railway system by closure of the Belfast Central Railway line from Ballymacarrett Junction (east of Queen’s Quay station) to Central Junction, just west of the former GNR(I) Great Victoria Street station (see: Link ). However, on a positive note, introduction of UTA built MED railcars gave Belfast – Bangor the distinction of being the first main railway line in the British Isles to be operated solely by diesel traction. In 1976, the Belfast Central Railway reopened as part of a project to replace both the GNR(I) Great Victoria Street station and the BCDR Queen’s Quay with a “central” station situated in east Belfast. Today (2013), Belfast – Bangor is an important part of the Northern Ireland Railways’ system, with services to Bangor originating from Portadown or the reinstated Great Victoria Street station. While diesel locomotives may occasionally visit with engineer’s trains, all passenger services are in the hands of Spanish built 3000 or 4000 class railcars.